Dhiren Savla, CIO, VFS Global, elaborates on the company’s digital vision that aims to always be one step ahead, responding to dynamic market changes. VFS Global is the world’s largest outsourcing and technology services specialist for governments and diplomatic missions worldwide. The company manages the administrative and non-judgmental tasks related to visa, passport, identity management and other citizen services for its client governments. It’s an early adopter of cloud and digital technologies. 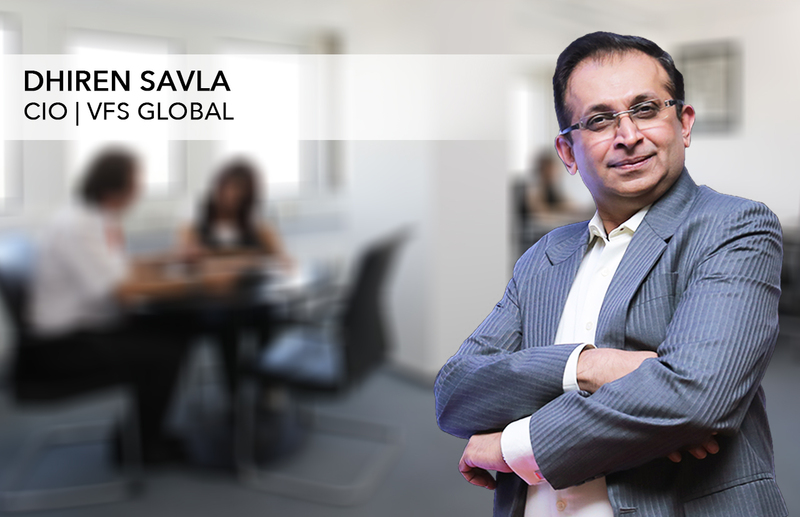 In this exclusive interview, Dhiren Savla, CIO, VFS Global, shares with us how the company overcame challenges to enable digital transformation for positive business outcomes. What are the top three business challenges of VFS Global in 2019? How do you plan to overcome them through the use of tech? Innovation and technology have always been more than just enablers for VFS Global. They are key business drivers that help us constantly push the envelope in developing an overall better customer experience in visa application processes at our centres. Since VFS Global operates in over 140 countries, for effective, reliable and secure IT operations, we need to keep evolving and adapting new and hybrid solutions. This has been made possible by using technology in the most innovative way. We are managing advancements with the help of technology, include supporting growth, meeting local compliance in the various regions we operate, expanding our services portfolio, and diversifying business. In the case of VFS Global, we have continuously used technology to redefine our service standards and strengthen our position as industry leaders. Today, with digital transformation happening in every sector, our digital vision aims to always be one step ahead, with constant upgradation in line with on-going dynamic changes in the marketplace. In line with these efforts, we have expanded key management competencies, with dedicated resources assigned for further developing ecommerce and digital offerings, and strengthening data protection compliance and information security. You launched ViVA, the first chatbot for visa services. How have customers received it and what business benefits have you gained? ViVA, the first-ever visa services chatbot, is also VFS Global’s first digital employee! Custom created with unique technology adapted to the visa and passport services industry, and launched for Australia visa applicants in India, ViVA assists with queries related to the application process, visa categories, rules and regulations, contact information, payment procedures, and optional services. We have received an overwhelming response for ViVA, and intend to expand it further. ViVA has had over 46,000 interactions to gain information. 42,000+ interactions out of these were resolved by ViVA and the rest formed a ground for ViVA to learn more for being a better assistant in THE future. ViVA has proved to be a quick learner and proudly stands at 95 per cent accuracy. So this is a win-win situation for all since it enables 24x7 support, and ensures unified responses to standard queries. It also frees up the bandwidth to focus on more critical and complex requests. VFS Global embraced digital technologies rather early. What challenges did you face during the transformation and how did you overcome them? The biggest hurdle for any transformation is a change in the organisation’s mindset. We strongly believe that the future is going to be more and more digital. We have approached this on two fronts. Firstly, we made a conscious effort to make the organisation and ecosystem digitally aware at every level of operation. Secondly, these initiatives were driven right from the top and constantly reinforced. This has really worked well as every single VFS Global employee now identifies with the journey we have embarked on. IT usage is gradually shifting from a Capex model to an Opex one. However, larger enterprises have been cautious in their approach to cloud, partly due to their investments in legacy infrastructure and control issues. Do you see larger enterprises totally shifting to the public cloud in the foreseeable future? We moved to IT as a consumable service seven years ago. This is largely an Opex-driven setup providing flexibility, variability and predictability. We embraced the cloud pretty early and have a large part of our workload on it (Private, Hybrid or Public). I distinctly remember the CEO of a top IT company stating, about 7-8 years ago, that enterprises won’t buy servers in the future—and we truly have not purchased even one in the last 6 to 7 years! The cloud is a reality and most companies will shift towards it—whether public, private or hybrid. Talent seems to be scarce as you try and deploy new technologies like Machine Learning, Deep Learning, NLP and AI. How do CIOs deal with such a situation? We strongly believe in rightsourcing. There is no single formula for insourcing or outsourcing. My advice is to retain the core and use your partners appropriately. We have a strategic relationship with some of the largest players in the industry and use small or boutique houses for our tactical or specialised purposes. This gives us agility as well as access to new technology.